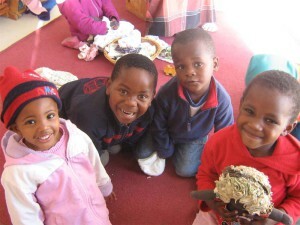 Imhoff Waldorf School’s main outreach project is Siyakhula Waldorf Educare. Siyakhula Educare is a small Waldorf Kindergarten for 35 children in the Masiphumelele township. 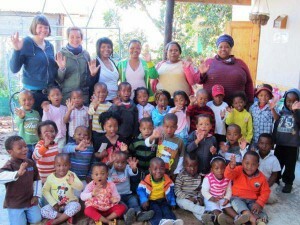 Spearheaded by Nicola Cox, Work for Love was started as an initiative of the Imhoff Waldorf School in 2005. Imhoff supported Siyakhula Educare at the outset when Imhoff facilitated a loan on behalf of a Swiss Waldorf School, which helped toward the purchase of the property for the Educare. Imhoff has been organizing weekly vegetable collections to supplement the lunches at Siyahkula and encourages parents to donate Waldorf toys and children’s clothes to Siyakhula. Any unused household items are donated to the weekly rummage sale held at Siyakhula. Many Imhoff parents regularly make financial contributions and/or volunteer in Work for Love’s programmes. The Imhoff teachers have opened their classrooms to invite the Siyakhula teachers to observe and assist and despite their already full working schedules they occasionally attend parent meetings and teacher meetings at Siyakhula to offer and share some of their experience, teaching materials and enthusiasm. Work for Love aims to create a model school that offers heartfelt, quality Xhosa Waldorf education by empowered, motivated and trained teaching staff and to prepare well rounded and bilingual (Xhosa and English speaking) children for entrance into other schools in the Valley.